At the Fort Frances Dental Centre and Emo Dental Clinic, we offer at-home teeth whitening systems. This system includes custom fit bleaching trays and professional strength bleaching solution. The trays can be worn for a few hours during the day or can be left on overnight. 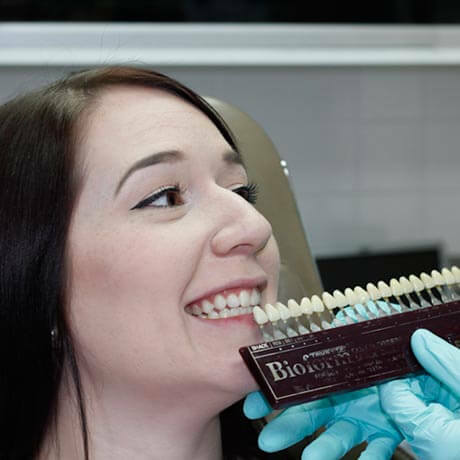 At your first appointment, we take impressions which we use to custom make your bleaching trays. A few days later, we deliver your bleaching trays. We will ensure that the trays are fitting properly and go over the instructions with you. Call us to book a consultation, and see if you are a candidate for teeth whitening. Watch the video below to learn about the Opalescence Teeth Whitening System, available at the Fort Frances Dental Centre and Emo Dental Clinic. Bonding is a cosmetic procedure done to improve the colour, shape, angle or spacing of your teeth. Tooth-coloured material, called composite resin, is applied to the teeth, shaped and hardened with a light. Your dentist can use bonding to fill in chipped areas, build up small or misshapen teeth, reduce spacing, or cover discoloured teeth. Bonding is done entirely by your dentist without requiring any laboratory work. Over time, bonding may wear down, but can be touched up by your dentist at future visits. Like bonding, veneers are a cosmetic procedure done to improve the colour, shape, angle or spacing of your teeth. Veneers are strong, thin shells that are typically made of porcelain. They are custom made in the laboratory and then bonded to the front part of your teeth. The procedure typically takes two appointments to complete. To prepare for the veneers, your dentist will first remove a thin layer of enamel from the front of your teeth. He will then take an impression so the laboratory can custom make your porcelain veneers. Your dentist may place temporary veneers until your porcelain veneers are ready for placement. Veneers are permanent and may need replacement in the future. Speak with your dentist about your treatment options and to see if you are a good candidate for this cosmetic procedure.